This Quinoa Cereal Recipe is quick, nutritious, delicious and filling for sure! Quinoa and Chia Seed are a great way to start your day and you can safely double this recipe if you prefer a larger breakfast or brunch. Don't worry so much about the fat and carbs in this homemade quinoa cereal. The quinoa and chia have healthy fats, protein, carbs and nutrients. I hope that you enjoy this easy and yummy breakfast. - Make sure to rinse quinoa before cooking and chill. I make a small pot, chill overnight and eat it a few days; maybe breakfast one or two days, or breakfast one day and as side dish for dinner. - You can add 2 tbsp of chia seeds if you like. Nutiva® is an organic brand and Bob's Red Mill Chia Seeds are a natural option, though not organic like the Bob's Red Mill Flax Seed. - Use the unsweetened So Delicious coconut milk. It's organic / non-GMO. - I use Bob's Red Mill Shredded Coconut Unsweetened. * I occasionally add the unsweetened coconut for flavor and texture. You can add strawberries, blueberries, mix berries, etc. for variety instead of the coconut calories and fat, or eat it just as quinoa and chia seeds. Add quinoa, chia seeds, shredded unsweetened coconut, stevia and 1/2 cup coconut milk in a cereal bowl. Mix well the ingredients well. I let it sit a few minutes until it thickens up to the consistency of oatmeal, but you can eat it immediately if you prefer to have it more liquefied. You can even add a splash more milk after it thickens ... basically, make this as you would eat oatmeal except this quinoa cereal has a light, fluffy, and slightly crunchy consistency. Why Should I Eat This Quinoa Cereal? Are you wondering why I suggest this quinoa cereal? Well, first of all, it is a clean delicious alternative to Oatmeal and processed GMO boxed cereals. It is also cheaper than buying packaged quinoa cereals. Additionally, quinoa is a gluten free whole grain type food that is actually not the same as the grains found in your regular cereals. Quinoa is a seed food from the spinach, swiss chard, beet family. It is an excellent source of fiber, protein, amino acids ( lysine, isoleucine), calcium, iron, phosphorus, riboflavin. It is considered a superfood (or super seed) because if it's health benefits and is absolutely delicious. You can buy or make quinoa noodles; use it in place of rice, couscous, wheat, etc. Quinoa is considered a good fat food. 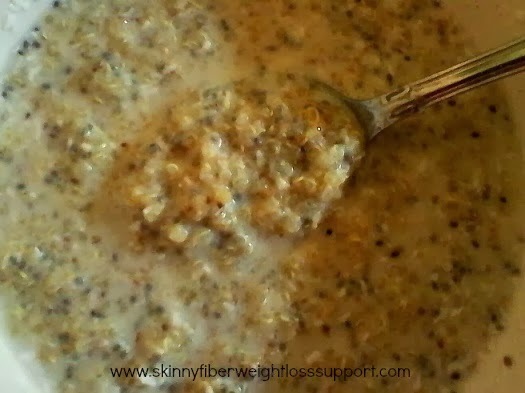 Why Should I Add Chia Seeds To My Diet / Quinoa Cereal? Chia seeds has 11 grams of fiber per ounce, as well as protein, calcium, zinc, omega 3, omega 6, magnesium, antioxidants, etc. They are considered a superfood (or super seed) like flax seed though better for digestion in it's unprocessed state and without the questionable risk of flax. The omega fatty acids in chia seeds help build new cells. They are also good for hair, skin, nails, teeth, bones, type 2 diabetes and belly fat. Chia seeds swell up and make you feel full longer, lower blood pressure and keep you hydrated. This seed helps waste move through body well. Plus, chia seeds can help to reduce food cravings. If you take high blood pressure pills, ask your doctor before adding chia seeds to your diet. Same for if you are allergic to mustard or sesame seeds. Chia seeds are considered a good fat food. Why Add Unsweetened Coconut To My Diet / Quinoa Cereal? In addition to making this quinoa cereal more delicious, coconut is also a source for fiber, protein, vitamin C, potassium, manganese, zinc, niacin, iron, thiamin, phosphorus, riboflavin and selenium. It does have saturated fat (bad fat), so you should eat it occasionally or in small amounts, though keep in mind that it is digested differently in your body than other foods with saturated fats and coconut provides energy. You may have heard that coconut and coconut oil is good for weight loss (specifically belly fat) and anti-protozoal, antiviral, antibacterial, antiviral qualities that help fight disease and support a good immune system. Coconut is a medium fat food. 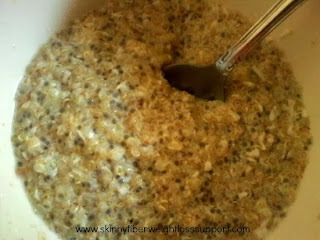 Let me know if you try this homemade quinoa cereal and whether you like it! It provides me with energy, plus keeps me so full, that I usually eat it for brunch and forget about snacking and even food until I realize it's close to dinner time.